The February 2008 issue of ARTnews came in the mail with a cover that was instantly recognizable. 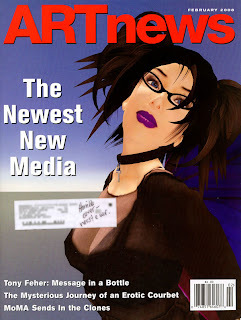 A Second Life avatar leaning into the headline "The Newest New Media." Underneath it, the address sticker and the hand written phrase. "horrible cover--worst ever." I admit that those words had me more than a little irritated, but I don't intend to rant about that. Instead, I tried to think about whether it in fact is a bad cover. Is the low polygon count of the figure that jarring? Or perhaps the lack of any reference point in the background that caused this unpleasant reception? Personally I find neither aspect to be problematic, and this leads me back to my first thoughts on the matter. "Museums are still very much behind in terms of showing this work," says Paul. She points out that museums are either wary of in-gallery, tech-based interactivity or simply lack the staff and the infrastructure to mount and support such works. Difficulties can arise simply in getting museum IT departments and curatorial staff to work together. I would consider it lucky if a museum actually has an IT department. Smaller museums can't afford dedicated staff for anything tech related, much less an entire department. So if these types of problems are recurrent in museums, it's not surprising that small private galleries would view this type of art with skepticism, to say nothing of individuals. It's unfortunate that there is always a lack of tolerance towards those who try to push the envelope, but such resistance I must allow to be inevitable on account of the subject's very nature. On the other hand, my guess would be that anyone who has ever created a 3D model, or just played Second Life, would be much less critical of this cover. In the end, as almost always it seems, the problem is ignorance. Equally as prevalent an antidote to this, and here again, is education on the matter. I am always curious to learn new things, and believe that most people are as well. I try to treat them as such, and will continue to speak in favor of tolerance towards art and artistic methods even when they are little understood.